The world of software development is ever-changing. It’s only a matter of time before current code becomes legacy which eventually becomes obsolete. The number one way to counteract this growth is to actually modernize alongside. Modernization not only keeps you current but allows for you to utilize better technologies. 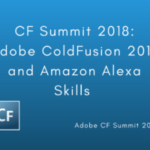 Adobe ColdFusion alone has been through many changes over the years, mostly for good. 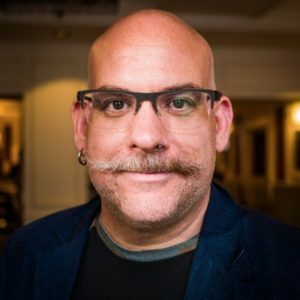 In Nolan Erck’s upcoming session at the 2018 CF Summit in Las Vegas, he will present to intermediate and veteran CF’ers practical applications past CFML theory. Let’s talk about the importance of modernization from a CIO standpoint and some real-world applications for modern CFML. To explain IT modernization, you need to understand what IT modernization is not. Modernization is not a destination. It is not an achievable concrete goal. IT modernization is a never-ending journey. Does that mean you shouldn’t take the first step though? Hell no. Software and IT technologies will not slow down for you or your business. Do not slow down for them. Modernization is more than just updating your servers and versions– although those are important to do. It involves changes in your technologies, employees, processes, talents, and strategies. There are many reasons why companies don’t modernize. Lack of resources. The time required for new training. Yet, the number one reason CIOs and companies don’t modernize is fear of change. Most people, in general, choose to stay in their comfort zones. Learning something new without knowing the benefits can be off-putting. 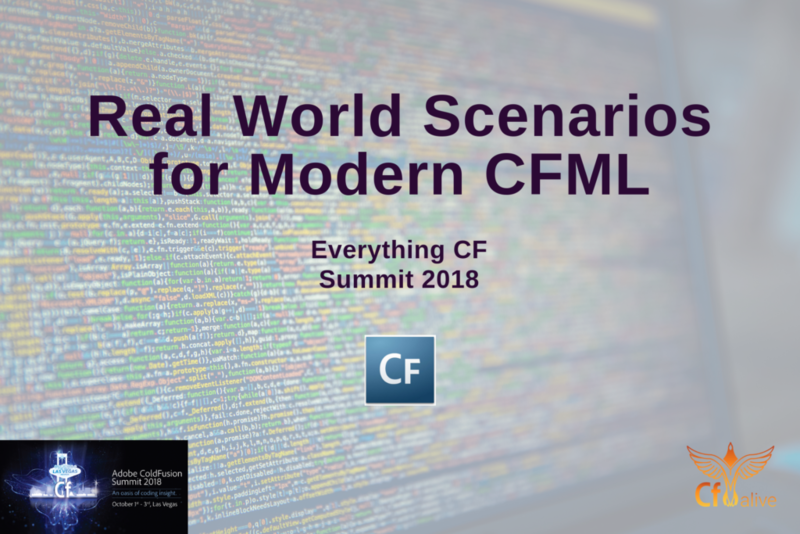 Conferences, such as the 2018 CF Summit or CF Camp in Munich, are great opportunities to learn more about the modernization journey you intend to take with your CFML. Fewer resources with better faster results? It’s clear to see why these processes are important. So, where would you even begin to start modernizing? Check out these tips to embark on your journey to modernization. You cannot change direction if you don’t know where your company stands in the first place. Learn the ins and outs of your system so you can properly develop a roadmap to modernization. Providing managerial pressure may work in some circumstances, but it is not the case here. Instead, empower your employees with a meaningful mission. Your employees need to be along for the ride as well. Help them help you by using these handy tools from Intuitive Leadership Mastery. IT Modernization may require some outside help, especially if your company is extremely outdated. Co-design your modernization roadmap together, and make sure they are at all of your progress meetings. Having a plan with actual milestone goals can help out tremendously. They can show you exactly where your company’s progress is and the direction it is heading. Achieving goals is also a great morale booster and motivator for you and your team. A PMO is a Project Management Office– or Officer. Establish a dedicated group or individual responsible for overseeing your IT Modernization. This will allow some of the stress to roll off you and create free time for you to focus on other much-needed company tasks. IT Modernization revolves around one key concept. Agility. Your modernization efforts should focus on the ability for your company and applications to scale quickly. The IT world is rapidly changing. Make sure your business can keep up. For more on the benefits of agility and speed, check out this article on Speed vs Control. During your IT modernization process, you will end up creating helpful modules that you can use again and again (particularly when modernizing your CFML). Make a catalog of these that you can recall as need be. Even better, share with other companies that may be able to use them. 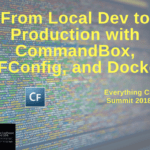 A great place to share your CFML modules and packages is on ForgeBox. Here you can share with others or find modules that you may need for your modernization efforts. In this Tech Talk, let’s take a look at three areas of modern CFML. A functional programming language is a one that focuses on immutable data and functions. Because building blocks in functional programming languages are actually functions –not components as ColdFusion– it is very common to pass functions as arguments. Likewise, return functions pass as results. 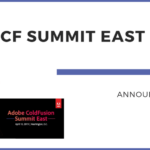 With the advent of ColdFusion 10, Adobe introduced closures allowing CF to act as a functional programming language in some regards. Closures are inner functions. These inner functions access the variables in outer functions. In turn, you can access the inner function by accessing the outer function. 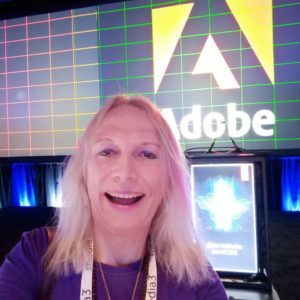 Adobe provides a great example when discussing closures. In the above example, the outer function returns a closure. Using the helloHindi variable, the outer function is accessed. It sets the helloWord argument. Using this function pointer, the closure is called. Although not very widespread in the CF Community as of now, we can see these closures take form in functions such as arrayMap() and arrayFilter(). Other examples of closures include the latest version of FW/1 and TestBox. FW/1 uses closures to provide a “builder” style syntax for developing REST API results. TestBox uses closures rather extensively when performing their BDD tests– be sure to catch up on BDD tests with Uma Ghotikar. This table from Adobe highlights the scope of variously defined closures in ColdFusion. As function argument Closure argument scope, variable scope, and this scope and super scope (if defined in CFC component). ColdFusion has seen its fair share of smooth operators, conditional and binary that is. 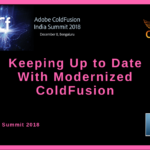 (Or its Development Community, *wink wink*) Let’s take a look at the evolution of operators through ColdFusion. Along with the release of ColdFusion 9 came the ternary operator. The Ternary Operator is a decision-making operator that requires three operands. These three components are combined using a question mark (?) and colon (:). This operator was great when it was released. It was often used to conditionally transform or default method arguments. Ben Nadal once claimed that the ternary operator is everything that the IIF() method call wanted to be. The way the operator worked was by evaluating the condition given. If it was false, the false statement would be executed. Vice versa if the condition was true. The ternary operator came with a downside though. Although its shorthand notation was much easier to write, it was also much harder to read. In ColdFusion 11 or Splendor, the Elvis Operator debuted. The Elvis operator is a binary operator and was introduced in a ? : format. It strove to shorten your conditional code and make it more elegant. The main purpose of the Elvis operator in ColdFusion is to assign the right default for a variable or an expression. In an expression, if the resultant value is not defined, then the object will be assigned to the leftmost part of the expression otherwise a default value (define at the rightmost part) will be assigned. In the above example, if userName is defined, it will be assigned to the myDisplayName variable. If the userName is not defined, the value “Anonymous” will be assigned to the myDisplayName variable. In the above example, if getEmployeeName(ID) does not return any value, the value “Joe” will be assigned to the employeeName variable. Nested structs had even more checks. But with the safe navigation operator, safe navigation is shown as follows. The question mark operator along with the dot operator make up the safe navigator operator. It makes sure that your previously used variable is not defined or java null. Instead of posting an error, the function returns undefined for that particular access. The great thing about the safe navigation operator is that it can be used at all levels. Even if a single element in a string does not exist, the access will return as undefined. It can be used for both function calls or function and struct access combined. You can also use it in conjunction with the Elvis operator. The safe navigation operator can really help developers process their code with agility and better performance. result_name.sql The SQL statement that was executed. result_name.recordcount Number of records (rows) returned from the query. result_name.cached True if the query was cached; False otherwise. result_name.sqlparameters An ordered Array of cfqueryparam values. result_name.columnList Comma-separated list of the query columns. result_name.ExecutionTime Cumulative time required to process the query. result_name.IDENTITYCOL SQL Server only. The ID of an inserted row. result_name.ROWID Oracle only. The ID of an inserted row. This is not the primary key of the row, although you can retrieve rows based on this ID. result_name.SYB_IDENTITY Sybase only. The ID of an inserted row. result_name.SERIAL_COL Informix only. The ID of an inserted row. result_name.GENERATED_KEY MySQL only. The ID of an inserted row. MySQL 3 does not support this feature. result_name.GENERATEDKEY Supports all databases. The ID of an inserted row. These results can be then cached and execute stored procedures. Remember, when using Cfquery tags, use them in conjunction with Cfqueryparam to help secure your databases from SQL injection. QueryExecute is a differentiation from the standard Cfquery tag. It simplifies the execution in the CFScript block. QueryExecute allows you to pass unnamed parameters within the query itself. Simply use a question mark as a placeholder for the unnamed parameter. It may be used as an independent function apart from the standard Cfquery tag. These are just a few modern tools that you can take advantage of when using CFML and Adobe ColdFusion. Remember, modernization is not here to give you aches and pains. It is here to help. Update your platform –if need be– and join modern CFML today! 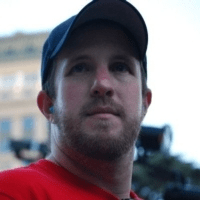 About the Speaker: Nolan Erck has been a software developer for the past 12 years. Starting in the multi-billion dollar video game industry, he was credited with both Maxis and LucasArts. Currently, Nolan manages the SacInteractive Group and South of Shasta Consulting.